Courtyard Cafe at Gregynog Hall & Gardens01686 650224work CafeThe Courtyard cafe, situated in the historic Gregynog Hall courtyard, is a beautiful location for a relaxing lunch, surrounded by dragon trees and containers of flowers, with indoor and outdoor seating for up to 48 people. A Welsh dragon, inspired by the medieval carving of the Blayney Room, and created in Gregynog oak peers down at you, as if looking for a hearty snack! Seasonal menus include traditional Welsh high teas with homemade bara brith, a variety of sponges and delicious sandwiches. All dishes are prepared by the resident internationally-trained chef, using locally sourced ingredients and cooked to order. 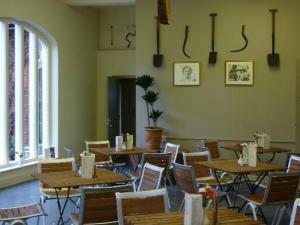 The Courtyard cafe, situated in the historic Gregynog Hall courtyard, is a beautiful location for a relaxing lunch, surrounded by dragon trees and containers of flowers, with indoor and outdoor seating for up to 48 people. 17 December 2018 - 28 February 2019 Closed for Winter. Re-open on Saturday 2 March 2019 and we will be open every Saturday and Sunday until the beginning of April when we open Tuesdays – Sundays. £2.50 Car parking charge applies.